The pattern used for the Hen of the Woods Mittens is my Waiting for Winter Mitten & Fingerless Mitts along with the following simple modifications which you can find right here. There is a video tutorial for the mini-bobble stitch pattern right here! 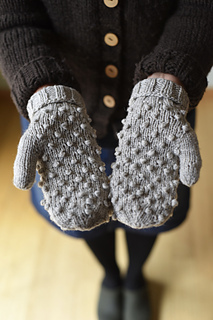 The sample mittens in the photo are the Medium size or the second size in the pattern. The finished pair of mittens weighs in at 60 grams. Then repeat rounds 4-11 for the pattern. Rnd 9: K1, then repeat (k1tbl, k3) to the last 3 sts, k1tbl, k2. The blog post has been updated.